Old cars, trucks, motorcycles...well I guess you could say anything that has a motor! A real thing of beauty. Congts on a job well done. 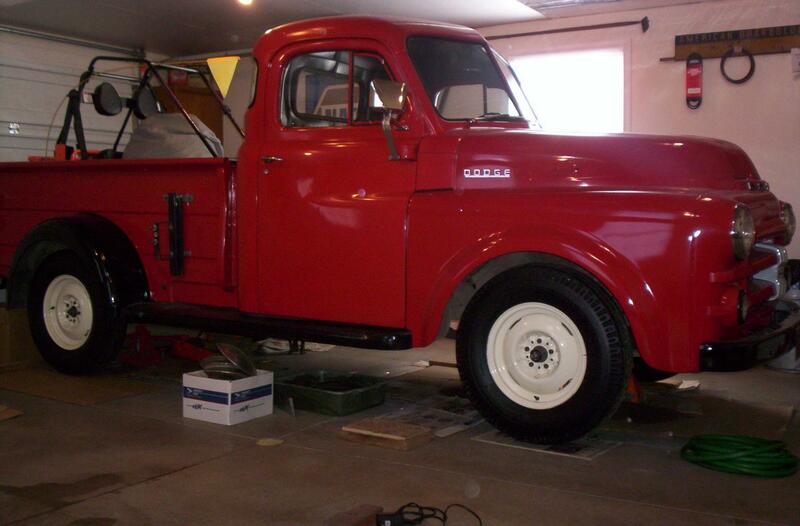 Nice to see someone so young working on one of these old Dodge trucks. I tried a search myself and couldn't find what I needed. I was looking for the thread on how to make the adapter plate. Welcome aboard. More pictures would be great. We all enjoy see the other trucks out there. Electrical problems just won't go away!!! Here is a picture of the Optima battery in my 1955 Thunderbird. I cut the top off and hollowed out the old battery. I inserted the new Optima battery on an angle so the posts were in opposite corners. Then I built a new top and you can see the results. These batteries spin my 292 like it was a 12V system. I'm not sure if this is the correct thread for this but I thought it was cool. Last week I was looking around to see about ordering new checks. I'm running out of my 1955 Thunderbird checks and the company I ordered them from originally is now out of business. Came across these and I copied it so I could post it here. In the process I forgot the site I found them on. This would be a good substitute for my T-bird checks. I hope everyone is having a very merry Christmas and happy holidays for those that don't understand what Christmas is truly all about. How Many Pilot House Trucks Have Survived? Wow. 45 minutes from me. Wish I had room and time. Love the fan on the steering column. John, How did you get the outside brazing so smooth? Very touching story Jeff. It is true that working on our trucks has a tendency of puting us in a place that makes it easy to forget about all the crazyness in the world today. It's almost like therapy. I had the same experience. I wasn't sure I would ever get my 1955 TBird bumpers back. It took over a year. Then I ended up having to send one back because they did a bad job on the rear bumper. I was furious!! They told me to send it back with a one week turn around. I told them I would show the car for the balance of the season (east coast) with the bad bumper then send it back in the winter. That winter I sent it back with serious concerns. Two weeks later I get a bumper back, except it was a front 55 TBird bumper not the rear. When I called them they didn't know anything about it and that my rear bumper was completed and would ship the next day. Another two weeks went by and no bumper. All this time I continued to hold the front bumper hostage until I got my bumper back. I finally got my bumper back, thought about keeping the extra bumper but that wasn't right. There was some poor sole out there waiting for his front bumper so I sent it back. The only good thing about all of this was they did an excellent job. I would never recommend them unless I lived there and could hound them on a daily basis.